New York City has been decimated by war and plague, and most of civilization has migrated to underground enclaves, where life expectancy is no more than the early 20's. When Deuce turns 15, she takes on her role as a Huntress, and is paired with Fade, a teenage Hunter who lived Topside as a young boy. When she and Fade discover that the neighboring enclave has been decimated by the tunnel monsters - or Freaks - who seem to be growing more organized, the elders refuse to listen to warnings. 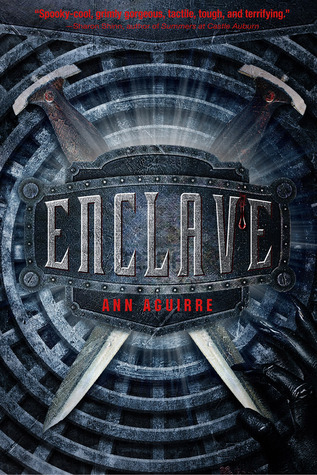 And when Deuce and Fade are exiled from the enclave, the girl born in darkness must survive in daylight - guided by Fade's long-ago memories - in the ruins of a city whose population has dwindled to a few dangerous gangs. Ann Aguirre's thrilling young adult novel is the story of two young people in an apocalyptic world- - facing dangers, and feelings, unlike any they've ever known. A friend of mine suggested this series to me, actually she sort of threatened me. But now I appreciate her for it. This dystopian series is about a 15 year old Huntress born and raised in the underground tunnels, trained to fight off "Freaks" which, yes, is basically zombies. She, and all the people who live with her have been raised to believe going outside, even if you can get past the zombies, will kill you. And Deuce gets partnered with the outcast that nobody likes, Fade. Together they discover that the Freaks have grown smarter and already taken over their neighboring tribe. But her superiors don't listen to her. She ends up exiled for taking the blame for a friend. And Fade goes with her. (Sweet Right). It was amazing how small her world was underground. Together Fade and Deuce battle gangs and Freaks through the forest, picking up unlikely friends along the way to find a settlement. I find it interesting that Deuce had no idea people could live above ground, or that there were numerous settlements. But what she learns quickly, even above ground everyone thinks she's too young to advise on how to handle the smarter and more organized Freaks. Nobody wants the advice of a 16 year old girl. So she starts her own army. I loved this part so so much. She started off with 12 people and they made a name for themselves, protecting their home. Over time she grew to over 200 and came to an unlikely alliance. Deuce literally saved her world. Her people from the army of Freaks look to kill them all. Of course she doesn't do it single handed. But she is the sole reason they fought back. And she's so humble about it. I will say this series is far more gruesome than many I've read. She likes to give great detail to many of her battles. She grew and matured so much. I enjoyed this series and it's definitely one I'd read again. This series is definitely one of my favorites! Great review!